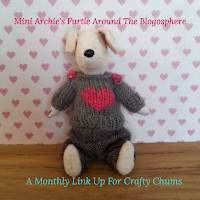 Archie the wonder dog: Fresh Sewing Day - finally! Fresh Sewing Day - finally! 1. Stained 1, 2. Stained 2, 3. Stained 3, 4. Stained 4, 5. Stained 5, 6. Stained 6, 7. Stained so far, 8. Back of Stained (I hope! ), 9. Thread catcher, 10. Fabric flowers, 11. 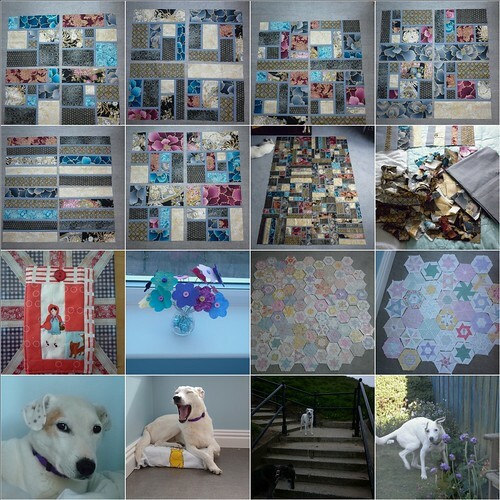 101 pieced hexies, 12. More hexies, 13. Not amused..., 14. P1000412, 15. Please can we go up all those steps?, 16. Did someone mention food? I've spent most of the month piecing my Stained blocks, trying to work out how to stretch the leftovers far enough to make the backing blocks (still not sure it's going to work!) and preparing hexies...and taking lots and lots of photos of Archie! I have a feeling there's a couple of big things going on in the UK this weekend - I just can't quite remember what they are...I'm sure it'll come back to me! Oh those hexies are awesome!! What a lovely mosaic! Love your stained glass....well, actually I love everything! I'm loving your hexies! We're going to a proper street party on Monday, quite a novelty for us Aussies! Really, really need to have a go at hexies, yours are lovely. What's going on this weekend then? Oh yeah! I'm running the Jane Tomlinson 10k on Sunday! Your hexies are gorgeous, every one of them is a little work of art, beautiful. Stained is going to be just so amazing! I sigh in delight when I see your hexies! I have never been able to play nice with them. what a great mosiac. What colours are you short of for the backing? Lovely projects in your mosaic! I like that little red riding hood pouch! Wooo a mosaic! Great looking stained quilt there! Loving the hexies. Oh the stained quilt is looking amazing so far! Loving those hexies too! What a lot of beautiful work! in all of the months of fresh sewing day, i've only managed to join in once. pitiful that i can't read a calendar, huh? your work for the month is gorgeous. Bravo! A post definitly worth a worthy comment, thanks. Been away . . so missed your knees up for Liz and Flip, Chaz, Camzilla, and Wills Whales, Kat and Hazza. No internet where I went, so nearly missed Archie! Loved your Thread Catcher . . you need to make a really really big one as a sausage catcher for Archie! I love your stained quilt and the hexies, a lovely mosaic of things. I had a great time at the retreat and I do wish I could have met you too. Maybe another time, I am going to have to figure out how to come back.